How is it going, Sweetheart? I’ve thought of a few things that might help you. Since Dan has lost this good-paying job, he will have to make major decisions, although his life with you is only just begun. I expect he would discuss all major actions with you, first, but I also expect he might act desperately, unexplainably. This is not all bad. Let me see if I can help you see what I mean. 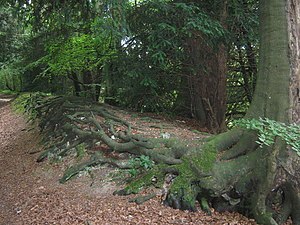 A huge tree has a huge root system. We think of big trees as having big roots, but many, many of their roots are small, like hairs. Every little tentacle has a real purpose, a job to do. Every little particle of the root system that goes out into the soil below the tree helps feed the tree and hold it in place. They have instructions, from their Creator, to extend in an efficient pattern into the soil. Dan’s maneuvering to provide for your lives may take on the tangled look of a root ball. He has hit a rock, or maybe more like a brick wall. He could not see the future. All he could do, all he has done, is to reach out in the expected, planned direction. Now he has to find his way, blindly, around the obstacle. It may take several false starts. He has to learn how to do his leading job, just as you have to learn how to do your submitting. It is his job to succeed. He will lead the two of you into better soil, trust me. You may never be wealthy, but it is not his job to cause you to be wealthy. Dan is supposed to work; God is supposed to provide. Dan is supposed to trust and obey. Learning to trust and obey can become involved. He may try a home business, a night job, or something for which he is overqualified. He may try moving, selling things, or eliminating the telephone. Whatever he thinks is good has to be ok with you. He is learning to hear God. Do not say a word. Sh! Student at work! Before you think I am being unfair, let me say that I know that you are a student, too. You are learning more new ways to smile encouragingly, submit gracefully, and suggest carefully. Dan will need and desire you to tell him if you see things he has overlooked or hear of openings of which he does not know. He does not need to be flattened by your knowledge, though, any more than anyone else does. He will need your willing trust, too. You need not be afraid of him, but respect him, give him space, and do what he says. Then if it goes wrong, it is not your fault.